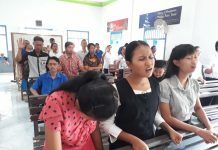 On March 3rd, 2017, there was KPPI (Praise and Divine Healing Service) in Kokole 2 Village, South Likupang Sub-District, North Minahasa Regency, North Sulawesi. KPPI was held at GMIM which is grazed by Rev. Virly Rengkung, STh with Old Law (Headman) Kokole 2 Village, South Likupang Sub-District, North Minahasa, North Sulawesi, Mr. Rulando Rintjap. Before the service was begun, the Church Assembly and the leader of the Old Law gave the announcement through the loudspeaker in the church and in the village hall, where all the people in Kokole 2 village could attend the service in the evening. 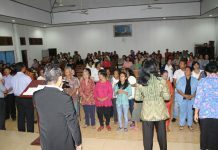 The service was conducted at hall of Kokole village 2, and started at 6.30 PM (Central Indonesian Time). Opened with praise led by Rev. Virly Rengkung’s wife. All the congregations praised God with joy. The event continued with a film of healing testimony of a woman who was cured from autoimmune pain whose whole body could not be moved suddenly, but when she came to God, hoped to God and came to KPPI, she experienced God’s touch and miracle of healing from the Lord Jesus. Afterwards followed by preaching Word of God delivered by Rev. Jeremy T. Sianturi, from KPPI Team, taken from Matthew 6:33 and Mark 5: 25-34 about a woman who had a-12-year haemorrhage. 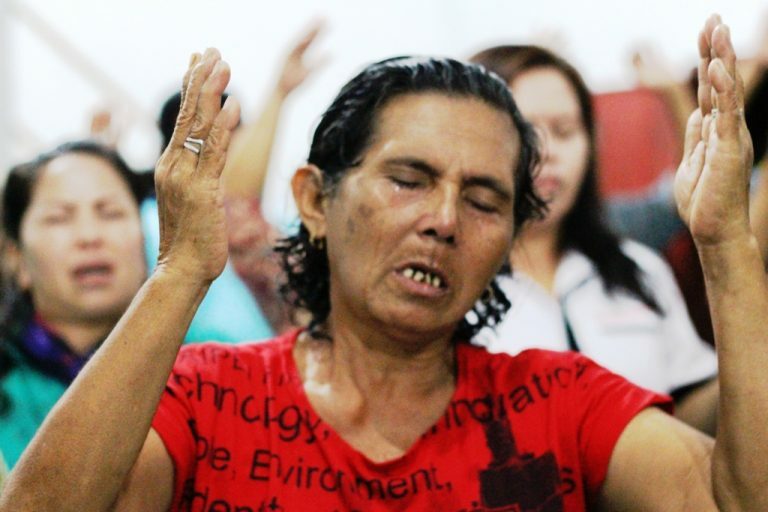 It was stated in order that the congregations have faith in the Lord Jesus like this woman, despite years of bleeding, but she came to the Lord Jesus with her faith and tried to touch the tassel of the Lord’s robe in the middle of the crowd. And this woman received healing. God’s servant invited the congregations to believe in God, indeed for God nothing is impossible. Praise God in the evening every congregation wanted to believe in the Lord Jesus and accept Him as their Lord and Savior. And during the prayer of healing every sick congregation was prayed by the Lord’s servants and counselors. Praise God there were 19 people whom God healed, among them recovered from headache, back pain, sore of uric acid, and a number of other diseases. Hallelujah! 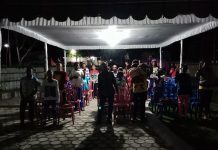 Blessed be the Lord who had visited His people in Kokole 2 village, South Likupang Sub-District, North Minahasa, North Sulawesi! Hallelujah!